Review: When the notion of a film’s plot line consists of big robots taking on huge alien monsters , it is a plot line that sounds strangely familiar and one that has been done to death. The likes of Godzilla and Transformers come to mind. However, under the guidance of the visually brilliant Guillermo del Toro, Pacific Rim is a fantastic blend of the two and is a terrific and thrilling ride. The film sets the scene with a prologue in which these frightening Kaiju creatures have destroyed plenty of cities and slaughtered lives across the world. Humanity’s last line of defence against these creatures is the Jaeger program, headed by Marshal Stacker Pentecost (Idris Elba) who seeks the help of Raleigh Becket (Charlie Hunnam) to come out of retirement and pilot one of these machines. The acting on show here is of a decent order with Charlie Hunnam proving to be a strong willed and determined protagonist. Alongside him we have Mako Mori (Rinko Kikuchi), a young and untested Jaeger pilot who is keen to prove herself to Marshal Penetecost. The two form a solid relationship as the film progresses and their relationship is a crucial element to the story as they must work together to build a solid neural link together to ensure humanity does not reach its doom at the hands of the Kaiju. Idris Elba is as awesome as he always is in everything he’s in and you can see the fuel in him that drives him to lead the ship through the difficult storm of mayhem and destruction that the Kaiju are bringing to the people of Earth. This desire is apparent within all of the leading characters and through it it drives the story forward. On the other hand, the apocalyptic mood of the film is counteracted by the humour of the two scientists in the film with Dr Hermann Gottlieb (Burn Gorman) and Dr Newton Geiszler (Charlie Day) who whenever they are on screen always seem to be bickering and squabbling with one another as to how to best defeat the monstrous invaders. Their rivalry and differences of opinion is fun to watch but deep down their desire to ensure humanity’s survival is apparent within both of them. While the relationship between the three leading characters is central to the story, the fight scenes on show are of monstrous proportions. The size of both the Kaiju and the Jaeger takes your breath away and you watch with glee and suspense as these two titanic monsters go head to head in jaw dropping and exhilarating fight scenes that are among the best that we have seen in this year’s selection of films. Cars get crushed and buildings are reduced to rubble as these great beasts do battle against these great machines of war. An Oscar nomination for Best Special effects could definitely come Pacific Rim’s way next year. 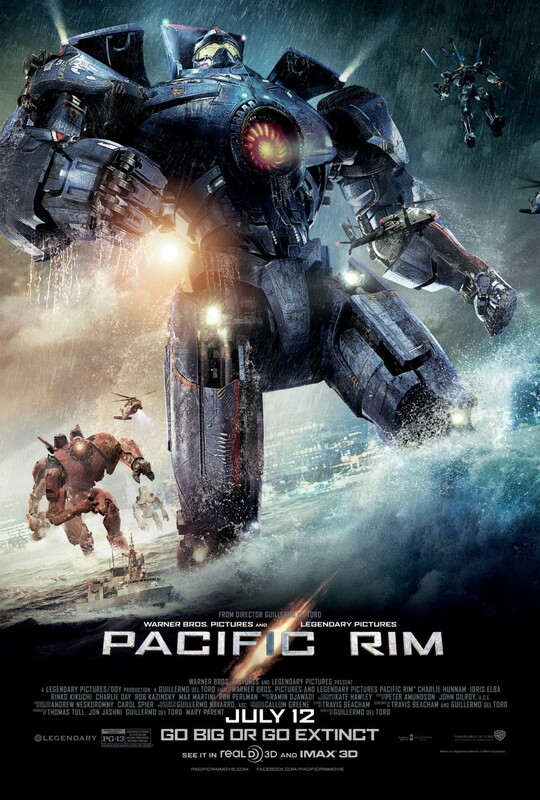 Thus with interesting characters and some thrilling action sequences, Pacific Rim is certainly a fantastic adventure that gets the adrenaline pumping and leaves the viewer excited and wanting more. Combined with great action sequences and some interesting characters Pacific Rim is certainly one of the finest films that emerged from the Summer Movie season of 2013. You come for Transformers VS Godzilla essentially and that is precisely what del Toro gives you, and it is nothing but damn good fun.